Disillusioned with the dullness and amorality of the banking world, he escapes back to the army for a third tour of duty. But in Afghanistan he discovers the savage, dehumanising effects that war has on both the body and the mind. Diagnosed with chronic PTSD on his return, he must now fight the last enemy - himself - in order to exorcise the ghosts of his past. Brutally honest and beautifully written, Among You brings home the harsh reality of front-line combat in Iraq and Afghanistan, and the courage of the troops who risk their lives for their country, as well as revealing the devastating after-effects of service. Jake Wood had served in Iraq two times and came back home the same as when he had left. However, when Jake returned home from Afghanistan he was a changed man. He was unable to concentrate on life. The time he served in Afghanistan continued to intrude into his thoughts. Jake would have what was called the "the thousand mile stare." He was thousands of miles away, in Afghanistan, seeing death, carrying the wounded, watching the wounded die and killing people he did not even know. Jake sought help and after sometime was diagnosed as having PTSD. He was glad that at last there was a name for his continued inability to stay focused. Little did he know that he had another long and arduous battle to fight. The health insurance from his job would not pay for any of his needed treatment because his disability was caused by the war. PTSD was just beginning to acknowledged as a impediment to men and women returning from war. Therefore, Britain had no manual to follow. 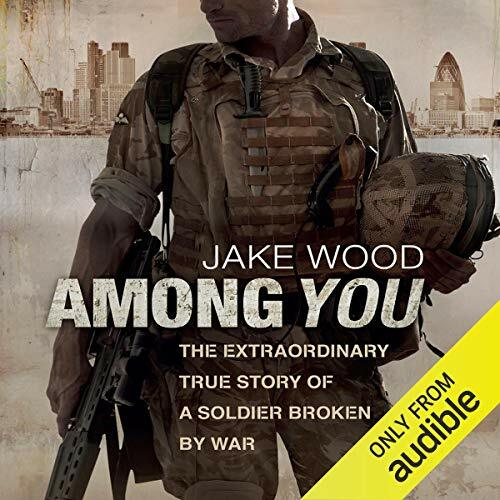 How was Jake Wood to survive in his world if he could not work because the diagnosis of PTSD had taken over his life? He had been given 9,000 lbs. from the British government and was told that he would receive no more. The true story, Among You, took Jake ten years to write. He knew that he'd probably never write another book. Writing was not going to support him. He got lucky one day and a lawyer, waiting in the line behind him in the court building, heard Jake's plight. She did not have to think very long and offered to help him pro-bono, which in lawyer talk means, free. The narrator, Joe Coen, was easy to listen to. He did pronounce many English words differently then I'd say them but maybe he was British and that was how they pronounced those words.The story did serve as an eye-opener in how the disability caused by PTSD had to be studied and justified as a disability that deserved benefits. However, I thought much of the story took way too long to get to the main event. I purchased this book because I wanted to learn about PTSD from its beginning as being recognized as a disability. Now that I've read about Britain, I'll need to search and find a book about PTSD and its beginnings in America. Well... how can a normal civilian person rate this book. This book is a description of one mans battle with his inner demons. The first part of the book which describes his long lost love is a little tedious. But when he starts describing his deployments and his experiences and reactions, it is bone chilling. The storyline took a little bit to take off but after it did this turned into a good read. A total story of a soldier at war and war within a soldier. The true effects of PTSD. Great job. Would you consider the audio edition of Among You to be better than the print version? It has the British accent applied appropriately in different circumstances that would not be evident in the book. What other book might you compare Among You to and why? Tin O'Brien's "The Things They Carried". Was in the Vietnam era but also an amazing account. Read by Brian Cranston - very well done - with an epilogue by the author. I do not have a favorite scene - but the end is heartwarming. I was expecting another gritty account of soldiers at war, which this gave with all the usual and more detail. However the real power to this book is being let into the mind of a modern soldier at war. Never before have I read or listened to a true account letting you know so much about the persons feelings, troubles, passion, fears and a whole kit bag full of anger. Some directed at enemies, some his superiors and oddly some at his safe run of the mill civilian life. From other books on modern day warfare, I got a feeling for how the machine operates, this time it's the man. It's given me a whole new respect and understanding of the TA and what those people who have or are serving our country do for us. If you could sum up Among You in three words, what would they be? Ease of following Jake's experiences. Beautifully written as one review said and I agree. I've read many similar books but this has to be one of the best in my opinion. Will no doubt listen to this again, there's not many books I can say that about. This book really brings home not just the horrors of war these people face but also how this effects their personal lives and the lack of support they face from those who are not on the front line. The author has written this in a captivating way taking you on a personal journey through his life and the part being a soldier and war has taken on it. The narrator helps bring this to reality. I anticipated Jake’s politics would be problematic for me but determined to listen, to be open and to recognise & respect the meaning and impact for him of his experiences & his perspective. The first section of his journey uncovers significant psychological and emotional vulnerability & need. The most rudimentary psych-fit assessment would make clear this man was not fit for what the military term ‘active service’; Jake himself evidences lack of relevant self awareness & insight. More than anything for me this book lays bare what we expect to be the case - a forces’ culture & mentality & a raft of systemic protocols & responses that simply fail to assess, understand, anticipate, address & support - as such I found it meaningful. Jakes perspective on ‘Joe public’ however is consistently uneducated & demeaning - that his girlfriend(s) and cohorts are crass & uninformed in their interests is a reflection of who Jake elects to have in his social and interpersonal circles; not all of us ‘public’ are politically naieve / ‘celebrity-obsessed’. This book is valid in laying out an individual picture of the devastation of PTSD & shines a bright light on the closed forces’ culture & systems. Jake as an author and a man has like all of us - a lot to learn; at time of writing he is able to acknowledge little of that. Whilst Im sorry prior to settlement via the forces Jake had to dip into ‘tens of thousands of personal savings’ he shows no understanding & contributes nothing in the relativity of his position. This is a powerful account & well-told of one mans thoughts and experiences & as such entirely valid. As a systems’ and structures’ account however, Jake’s work doesnt & cant for me, make it - and wont until he learns to respect & recognise ‘Joe Public’ as not lumpen. Jake you have inspired me to do what is right for myself. After listening to your struggle with PTSD of which I am struggling now myself. I feel the same emotional turmoil so I understand what you went through in those dark days. My time in Afghanistan still looms in my body and mind but with the help I am now receiving I can hopefully put it all behind me. You're a great man Jake and I am glad I stumbled across your book. Take care mate from a Brother in Arms. Part time on the front line? An incredibly moving account of human sacrifice caught between giving 100% and yet being recognised <1% by the government that sent him forwards, to enforce its defense policy. I really do empathise with what Jake went through but found the book quite boring. Beginning and end were good but got a bit lost in the middle. Struggled to listen at normal speed had to speed up narration. Excellent! thought provoking and inspiring. A dark start with a hopeful finish that lifts your soul...fantastic reading, highly recommend.